with CPTRAX for Windows - an activity auditing and alerting tool. HIPAA 164.308 (a) (1) (ii) (D): "Procedures to review system activity". HIPAA 164.308 (a) (3) (ii) (C): "Procedures for terminating access". HIPAA 164.308 (a) (4) (ii) (C): "Procedures for auditing and changing access rights and policies". HIPAA 164.308 (a) (5) (ii) (C): "Procedures for recording login activity including failed login attempts". HIPAA 164.308 (a) (5) (ii) (D): "Procedures creating/changing passwords". HIPAA 164.308 (a) (6) (ii) (D): "Identify and respond to suspected or known security incidents". HIPAA 164.312(a): "Procedures for access control". HIPAA 164.312(b): "Procedures for recording system activity". Be in compliance at every audit. CPTRAX for Windows assists with your HIPAA Compliance effort by providing real-time tracking of user logons, logouts, and failed login attempts as well as complete audit trails of selected file system access. CPTRAX can deny creation and renaming of executable files located on Windows Servers. This feature ensures unauthorized executable files are not created. Block the creation and renaming of files based on various parameters, including any portion of the filename including the path. CPTRAX can record logons and logouts occurring within your Windows and Windows Terminal Server (Citrix) servers. 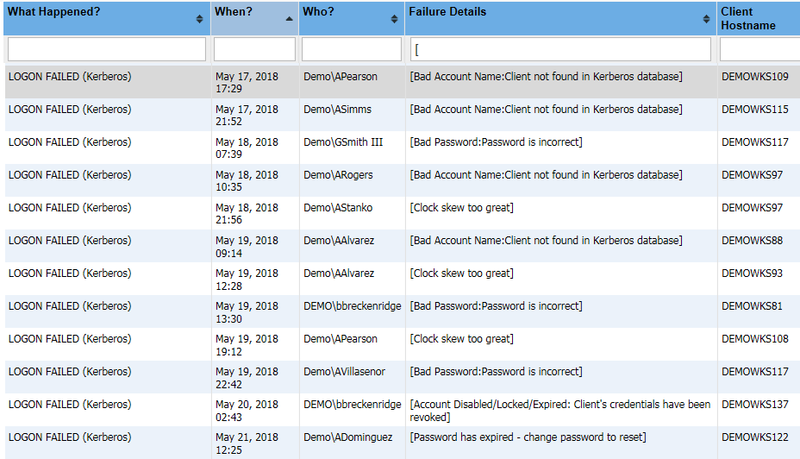 Track failed logon attempts including those using an incorrect password as well as those using a non-existent account. The failed logon name, error type, IP address and workstation name are all recorded. Failed logons can be separately track based upon the originating IP address. Track access to sensitive files stored on your Windows File Servers.